Magdalena de Vries, South Africa’s foremost classical marimbist, has won all the major South African music prizes and international scholarships. After obtaining performer’s licentiate diplomas (with distinction) from both the Associated Board of the Royal Schools of Music and the University of South Africa, two of the most prestigious South African overseas music scholarships were awarded to her and enabled her to pursue postgraduate studies in percussion as the first foreign student at the Tokyo College of Music under Professor Atsushi Sugahara. 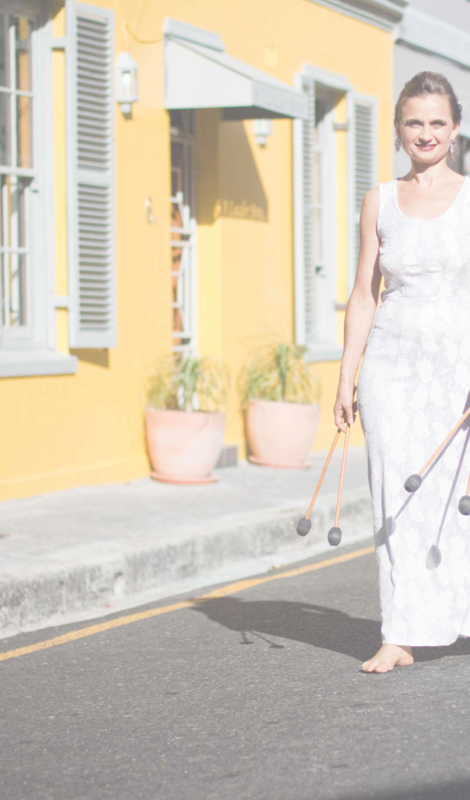 As orchestral percussionist, Magdalena has worked with the Yomiuri Nippon Symphony Orchestra (Tokyo), attended the 2000 Festival de Musica de Canarias as member of the former Cape Town Philharmonic Orchestra, and currently regularly works with all major South African orchestras. Magdalenea won the first prize in the Performing Australian Music Competition in London, May 2001, and was subsequently featured as guest soloist on BBC3 In Tune. In 2003 she formed Duo FourIVTwo with South Africa’s foremost vibraphonist, Frank Mallows. The duo has performed with great success at the Grahamstown National Arts Festival, the Baxter Concert Hall (Cape Town), the Aardklop Festival (Potchefstroom), Northwards House (Johannesburg), Baroque in the Bush (Kruger National Park), the Franschoek Festival as well as the ZK Matthews Auditorium. Magdalena has performed a large number of world premiéres including works by Errollyn Wallen, Peter Klatzow, Robert Fokkens, Paul Hanmer, Clare Loveday, Alexander Johnson and Hendrik Hofmeyr. In 2006 Magdalena was invited to perform once again as concerto soloist with COSA and was one of the featured soloists at the RMB Starlight Classics, performing the world premiére of Mozart for Marimba, arranged especially for her. In August 2007 she performed Bartok’s Concerto for Two Pianos and Percussion with the JPO and in September 2009 she was once again one of the featured soloists at the RMB Starlight Classics in Johannesburg. In September 2010 Magda performed the South African premiere of La Folia, Karl Jenkins’ marimba concerto and in March 2011 she shared the stage with Katherine Jenkins at the RMB Starlight Classics in Cape Town. Most recently she performed as soloist with the JFO performing the world premiere of Peter Klatzow’s Concerto for Marimba, Vibraphone and Strings. As recording artist, she is featured on CDs by Claire Johnston, Denzil Weale, Hannelie Rupert, Ockie Vermeulen, Duo FourIVTwo and Acoustic Moodz. MarimBaroque, released in November 2013, is her 1st solo album. As adjudicator, she is chairman of the Stellenbosch National Ensemble Competition, and has been on the panel of the Performing Australian Music International Competition in London, as well as the ATKV Muziq. As educator, she lectures marimba at Beaulieu Preparatory School and percussion at the Universities of Pretoria and Witwatersrand and is the percussion instructor for the MIAGI Youth Orchestra. She has also set all the percussion syllabi for the UNISA Directorate of Music practical examinations. Magdalena is the fulltime marimbist of Duo FourIVTwo and works as freelance percussionist with the Johannesburg Festival Orchestra.